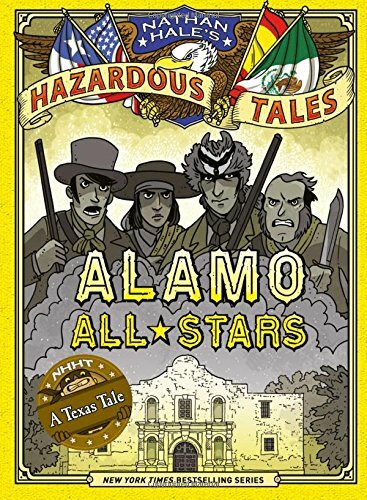 From Nathan Hale, #1 New York Times bestselling author and Texas Bluebonnet Award Master List maker, comes the definitive graphic novel about the Alamo. Hale relays the facts, politics, military actions, and prominent personalities that defined the Texas Revolution in factual yet humorous scenes that will capture the attention of reluctant readers and fans of history alike. In the early 1800s, Texas was a wild and dangerous land fought over by the Mexican government, Native Americans, and settlers from the United States. Beginning with the expeditions of the so-called “Land Pirates,” through the doomed stand at the Alamo, and ending with the victory over Santa Anna at the Battle of San Jacinto, the entire Texas saga is on display. Leading the charge to settle this new frontier is Stephen F. Austin, with a cast of dangerous and colorful characters, including Jim Bowie, William Travis, David Crockett, and others. Through his vivid depiction and additional maps, and biographies located in the back of the book, Nathan Hale brings new insight for students, teachers, and historians into one of the most iconic structures in the United States. If you have any questions about this product by Amulet Books, contact us by completing and submitting the form below. If you are looking for a specif part number, please include it with your message.